This Krabi villa situated off the Na-thai road is only 10 minutes away from the Tourist centre of Ao-Nang and it's beaches. This Krabi villa situated off the Na-thai road is only 10 minutes away from the Tourist centre of Ao-Nang and it's beaches. And only 25 minutes from Krabi town. The property itself is set back 100m from the main road. The main bungalow has a spacious open plan design surrounded by tall windows and doors creating a light and bright living environment. Set around a well equipped kitchen are a dining area and lounge with a large widescreen TV and comfy sofas. Along with high speed wi-fi connection and full air conditioning throughout. Step outside of the main living room at the rear of the bungalow onto a decking area complete with private 8m x 4m swimming pool and family BBQ area. 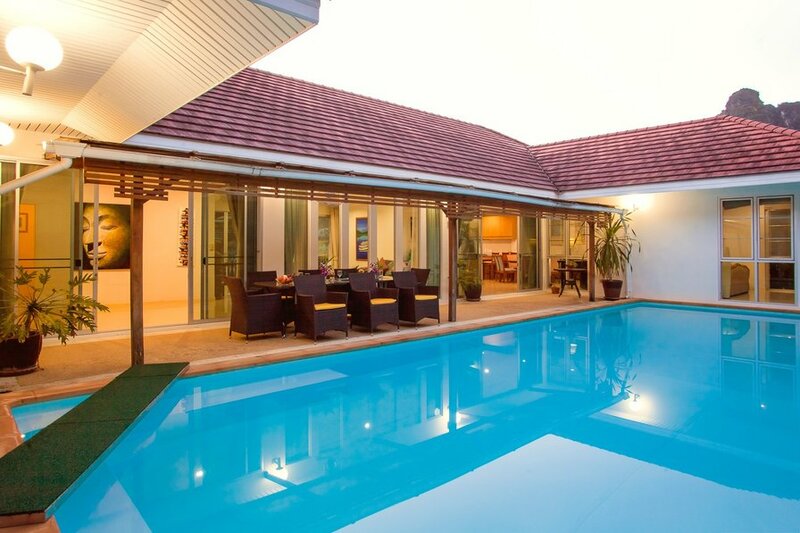 The villa's 4 bedrooms will accommodate up to 10 guests comfortably. The Master bedroom has a king size bed and ensuite bathroom with walk in shower. A second bedroom has twin beds, while the third bedroom has a queen size bed. All have ensuite bathrooms and ample storage space. The separate guest bungalow to the right of the pool, also has a well equipped kitchen with washing machine. A queen size bed and bunkbeds for the younger guests, along with ensuite bathroom. The 2 bungalows can only be rented as one. The property also has a large, private car parking area. The entire property is fenced all-round and has a security guard on duty from 6pm until 8am providing complete privacy and security.